I requested a meeting with the Minstry of the Environment at the annual UBCM convention to discuss merging the deposit recycling system with the curbside recycling system. There has been ample critical commentary (e.g., Facebook), so I thought I should take a few minutes to sketch out the issues and underlying rationale for this. The deposit system emerged in the 1970s as a response to pollution (remember this TV spot?). The underlying assumption of the deposit system is that people will not recycle unless they have an economic incentive to do so. Thus, laws were enacted to force retailers to charge a deposit for each beverage can and bottle they sell. When you bring your beverage container back, you get your deposit back (so the financial impact is zero). The retailer is responsible for dealing with the containers properly and their cost of doing so is built into the their prices. The curbside system is a more recent development and emerged from weekly garbage collection. The realization that landfills were filling up led many jurisdictions to do their best to divert waste from the landfill stream by, for example, recycling paper, cardboard, plastics, and so on. There is no deposit-and-return system for curbside recycling. You pay for it (or at least part of it) on your garbage bill. Recently, the province of BC has shifted to an extended producer responsibility (EPR) model, in which producers have to pay into the recycling system in proportion to the lifecycle cost of their packaging. The idea is to provide producers an incentive to reduce packaging. Of course, the EPR costs are built into the price of their products. 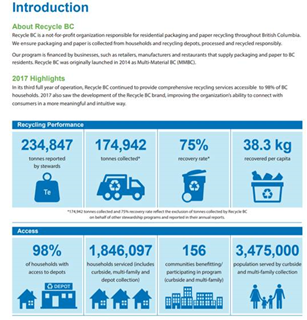 Both system have evolved and consolidated over the years and we are now left with two large non-profit organizations to manage recycling in BC. Encorp is responsible for the deposit system (beverage containers) whereas Recycle BC (formerly Multi Materials BC) is responsible for everything else. In practice, Recycle BC collects EPR fees and then subsidizes the RDOS to pick up recyclables at the curb. The RDOS in turn contracts to a private sector hauler (currently Waste Connections) to do the actual pickup. Sorting into various recycling streams and processing is done in Kelowna. Fortunately, this does not seem to be true. 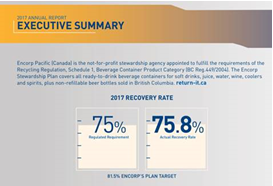 If you look at the annual reports for the deposit system (Encorp) and the curbside system (Recycle BC), you see something pretty shocking: Both organizations report about the same recovery rate: 75%. Put differently, it seems that people are just as likely to recycle a plastic strawberry container as a beer can, even though the beer can yields a dime if returned to a retailer or taken to a special purpose depot (like J&C in Penticton). The convenience of the curbside system is at least as large a motivator as the economic incentive embedded in the deposit system. In addition, attitudes have changed dramatically since the 1970s. Those who claim that the demise of the deposit system will result in beverage cans strewn everywhere seem to forget about coffee cups. There is no deposit system for coffee cups. But yet, when we look around us, we don’t see coffee cups everywhere. At least I don’t. It seems that people know how to put their coffee cups in the garbage (or, in the bigger centers, they know how to put their coffee cup in the organics waste bin and the lid in the recyclable plastics bin). The curbside system is increasingly critical. It will grow beyond garbage, recyclables, and yard waste and will eventually encompass other streams, such as food waste/organics. It would be relatively simple to add beverage containers to the curbside system: the habits are established, the trucks are rolling, and the infrastructure for sorting and processing exists. You store beverage containers at your home until you are ready to take them to a retailer or depot. Unless the containers are well rinsed and dry, there is some risk they will make a mess of anything that is not a pickup truck. Then, you have to sort them into little trays so that they can be inspected and counted before being unsorted into big bags. If you are elderly and unable to get to the depot, or have better things to do with your Saturday, you may wait for a charity organization to pick up your bottles and take them in for you. You lose the deposit, of course, but the team gets to make money and you feel the warm glow of being a humanitarian. Unfortunately, it is getting harder to find teams willing to do this, at least in this neck of the woods. I can see why, based on my own family’s experience: A tank of gas, a day or our lives, a messy and unpleasant experience, and a few bucks in return. And show me a charitable organization that doesn't prefer its donations in the form of a cheque instead of a sticky bag of cans. Things are a bit easier for urban residents. There is generally a steady stream of people ready to pick up cans and bottles from alleys and garbage cans. This comes with its own downsides, of course, but we can ignore them for now. The point is: the rural experience is quite different from the urban experience when it comes to the deposit system. There are no “binners” in my neighborhood, at least not on a regular basis. We add beverage containers to the curbside program. This means you simply toss these items into the correct bag or container and someone comes to your house to pick them up with the rest of your garbage, yard waste, and recycling. The money saved by moving to a single recycling system is used to improve the curbside service. Alas, it is not that simple. The deposit system has acquired a completely seperate dimension: one that has more to do with charitable giving and social support than the mechanics and economics of solid waste management. This other dimension is about poverty, inequality, homelessness and (often) mental health/substance abuse. Is this other dimension—the charity/social safety net—so important that it makes the deposit system of recycling, for all of its flaws, worth keeping? I don't think it is. Here's why: The deposit system currently collect $90M per year from consumers and distributes most of that money back into the community as deposit returns. But, if we assume that the charity/social safety net dimension is significant, this means the people who pay the deposit at the store are not the same people who get the deposit back at the bottle depot. In other words, the $90M is effectively a sales tax levied on a subset of goods (beverages). Given this setup, imagine we have moved beverage containers into the curbside system (so the cans and bottles are no longer a factor at all) and we are focusing on replacing the charity/social safey net dimension. Specifically, pretend we are proposing a new $90M sales tax for BC to replace the deposit system sales tax. The purpose of the new tax is to tackle social problems like poverty, inequality, homelessness and mental health/substance abuse. All those in favor of the deposit system should be in favor of the new tax (after all, they are no longer paying the deposit, so it costs them the same). The question is how best to spend the $90M? How should the new tax be distributed to British Columbians? How should we get the most bang for our buck and make real progress on thorny social problems? Allocate the benefits to needy citizens based on a scheme in which we deliberately leave our refuse lying around and those who need help scavenge, travel across town, do some meaningless work, and receive small payments. The scheme makes no claim to accomplishing meaningful work and solves no meaningful problem other than to transfer money. But this money could just be transferred directly. The primary beneficiaries from the scavenger hunt are those abled-bodied enough to compete. Frail, elderly, and mothers with young children need not apply. I am pretty sure no one would suggest this as a solution to anything. So now that we can address the pollution/recycling problem using other existing infrastructure, why would we cling to a $90M social assistance program with so many flaws? I don’t know either. I am pretty sure we can do better. How big of a social program is binning? Encorp collected just under $91M in deposit fees in 2017. However, because the recovery rate is not 100%, they only paid back $71M in refunds (the balance went to offset their recycling costs). Let's assume the entire $71M went to people in need. That is, assume that everyone donated every can and bottle to someone less fortunate. Now compare this to what the Province of BC spent in 2017 on "social services": $4,723M. So the deposit system is less than 1.5% of the social safety net. For every dollar of tax money spent by the province on helping the needy, cans and bottles contributed another 1.5 cents. The NDP government forecasts increases in social spending for 2018 of an additional $594M. That increase is, by itself, more than 8 times larger than all the benefits achievable through the deposit system. So say what you will about the merits of the deposit system, but just don't say it is "critical" to the province's social safety net. That is mathematically impossible. Something worth 1.5%—equal to rounding errors in most years—cannot be a critical part of anything. Visible yes. Critical no. Once again, Mr. Brydon, you have elucidated a very interesting proposal. While I am one of the people that does, in fact, recycle my cans, I can see the application of what you are suggesting. The real problem I see is that the $71M will get lost in the smoke and mirrors of government. Otherwise a very informed and innovative thought. Thank you for sharing it, and I will seriously consider what you have said. This is just one further reason why you are not allowed to step down from the RDOS.